I was joined in the studio for a while by Georgios who chose some of the songs we heard during the first 40 minutes of the show. One of the songs we heard was by Sofia Vembo - a video of her singing circa 1955 is below. Click here to read the new press release with some additional information regarding special guests and prizes. Please give it a few seconds to load because it is a PDF file. Or you can read more at WPRB.com or see below. 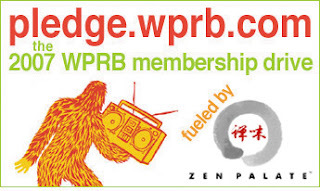 Pledge Online or by phone: You can make a pledge online anytime on the secure website: https://pledge.wprb.com/ WPRB operators will be standing by at 609-258-1033 to take pledges during all hours of the broadcasting day. Please show your support for WPRB’s unique and varied programming. There will be specialty gifts including Greek CDs available during Musical Odyssey next week (Sunday October 14th 1:00 - 3:00 PM EST) for those that pledge at a certain level. More details will be available during the show on October 14th. Requests and comments are welcome at greekmusic@gmail.com or leave a comment on this blog.